A deliciously rich and simple vegetable pleasure that is sure to wow your guests with its breathtaking appearance. Perfect with rice, or as a side dish to complete a feast, it works brilliantly as a pasta sauce or equally on toast for a quick lunch. Vegan, GF & healthy! Preheat the oven 160°c fan/180°c/360°f. In a saucepan over a medium heat add the onion, garlic and 3 tbsp water. Fry for 7-10 minutes stirring regularly until soft and translucent. Add the passata, tomato puree, basil, thyme and a generous pinch of salt and pepper into the pan and stir. Bring the mixture to the boil before removing from the heat and stirring through the balsamic vinegar. Set aside to cool. Slice the courgette, aubergine and tomato as thin as you can (about 2mm in thickness). If you have mandoline you can use it here. Depending on how large your aubergine is you may want to cut each slice in half to create a semi-circle shape so that they sit better in baking dish. Pour the tomato sauce into the bottom of a medium sized oven proof dish. Layer the vegetable disks in lines over the top (ie. tomato, courgette, aubergine, tomato, courgette etc...) pushing each one halfway into the passata. Sprinkle the finished arrangement liberally with salt and pepper. Cover the dish with foil and bake in the preheated oven for 45 minutes. Remove the foil and continue to bake for 10-15 minutes until the vegetables are soft and have a little colour. Remove from the oven and garnish with more basil before serving. Perfect for batch cooking this ratatouille will keep perfectly in the fridge for up to 4 days or in the freezer for 3 months. To reheat, just pop back in the oven until piping hot. 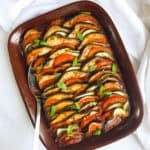 This baked ratatouille is so versatile! I love to eat it on its own with rice, but it is great served as a side dish to fish, as a pasta sauce, on toast or even whizzed up into a soup. When laying your vegetable disks, don't worry about it being perfect!! Ratatouille looks its best when it is slightly rustic and will still taste just as delicious. If you don't like all the vegetables I have used here, feel free to change them up. This baked ratatouille also works great with pepper, squash or very thin slices of potato. Try to get a passata without any added additives or salt. The ingredients label should read 'tomatoes' only. Left over passata can be kept in the fridge and can be used to make a multitude of recipes including my Shakshuka! The same rule applies for the tomato puree. The ingredients list should read 'tomatoes' only. The balsamic vinegar adds a wonderful depth and sweetness to the tomato sauce, but if you would prefer you can leave it out.